ASSIST strongly believes that sustainable development can only take place when the people themselves effectively own, execute and manage their development process. Therefore, the cornerstone of our work depends on the forming and strengthening of People’s Organisations once a community has realised that its development is in its own hands. These democratically elected organisations represent the needs and aspirations of all their community members and take the lead in various development activities. 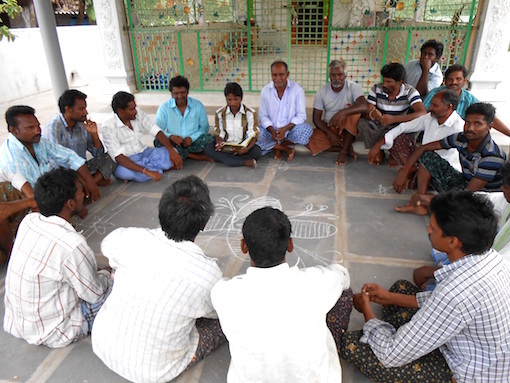 People’s Organisations include Village Development Societies, (Women) Self-Help Groups and Mutually Aided Co-operative Thrift and Credit Societies. Once these organisations are established, its members need to have the knowledge, skills and capacities required for effective management and the execution of their programmes. ASSIST provides training on various issues like leadership, management, identifying problems and finding solutions, uniting community members and mobilising them to participate in development activities, and applying for funds from local Government institutions.